Bulettes (or "land sharks") use their powerful claws to tunnel through the earth when they hunt. 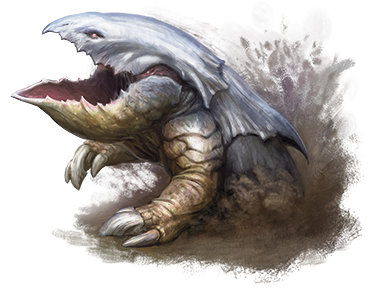 A bulette is a massive predator that terrorizes any lands it inhabits. Also called a “land shark,” it lives only to feed. Irascible and rapacious, bulettes fear no other creature, and they attack with no regard for superior numbers or strength. Some sages believe the bulette is the result of a mad wizard’s experiments at crossbreeding snapping turtles and armadillos, with infusions of demon ichor. Bulettes have been thought to be extinct at different times, but after years without a sighting, the creatures inevitably reappear. Because their young are almost never seen, some sages suspect that bulettes maintain secret nesting grounds from which adults strike out into the world.